Lasagna is the perfect dish to make when serving a crowd, because it can be made in advance, and just about everybody loves it. It is a layered dish with numerous levels of pasta alternated with sauce and ingredients such as meats, vegetables, and cheese, and usually topped with melted grated cheese. Once you learn how to make lasagna with this basic recipe, you can vary the recipe to suit your tastes. You can make it vegetarian by substituting spinach or roasted vegetables instead of the ground beef. You can make it meatier by adding sausage. You can make it leaner by using ground chicken or turkey instead of beef. Not only can you change up the meat and vegetable ingredients, but you can make it creamier by using an alfredo sauce or vodka sauce. You can make it Mexican-style by using seasoned taco meat, enchilada sauce, and pepper jack cheese. The possibilities really are endless. The flat, wide lasagna pasta noodles are believed to be one of the oldest types of pasta in the culinary world. The dish is believed to have originated in the Naples region of Italy during the Middle Ages. Although, in ancient Rome, there was a dish similar to a traditional lasagna called lasana or lasanum, which is Latin for the words "container" or "pot." Preheat oven to 375 F. Spray a 9- x 13-inch baking dish with cooking spray. Drain, if it's oily. Set aside. Place about 3/4 cup of the spaghetti sauce on the bottom of the prepared pan. Top the sauce with a layer of four of the lasagna noodles in rows (it is OK to overlap the noodles, if necessary). Top that with half of the ricotta cheese mixture. Then top that with half of the ground beef. Then add the remaining Asiago cheese. Top that with one-third of the remaining spaghetti sauce. Then, repeat the layer: four lasagna noodles, remaining ricotta mixture, remaining ground beef, the shredded Parmesan cheese, and one-third of the spaghetti sauce. 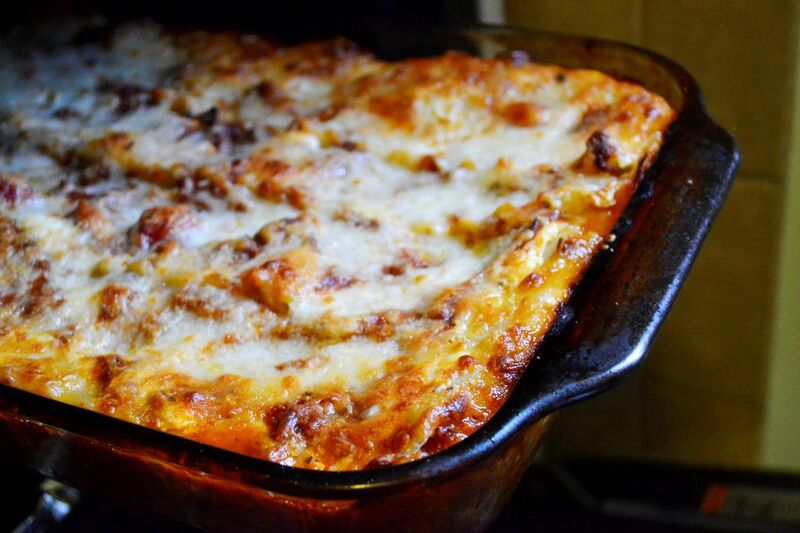 Put the final four lasagna noodles in a layer on top. Slather the top with the remaining spaghetti sauce. Sprinkle the shredded mozzarella cheese over the top. Cover with aluminum foil and bake 40 minutes. Remove the aluminum foil cover and bake an additional 10 to 15 minutes until bubbly, and the cheese is golden brown. It is important to let the lasagna rest at least 15 minutes before serving. It needs to set. Otherwise, it will be a gloopy mess when you cut it. Cut and serve with garlic bread and a Caesar salad.